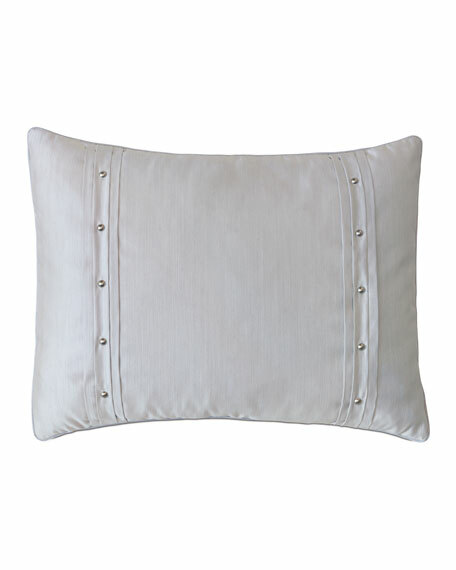 Sham with pleats and stud trim. EXCLUSIVELY AT NEIMAN MARCUS 350-thread-count cotton percale has a tight, uniform weave that results in a smooth, crisp feel and matte look. Accented with tape detail in your choice of colors. Machine wash. Made in the USA of Portuguese fabric. Standard sham with embroidered scallops. 350-thread-count white cotton percale. Optional 3-initial circle-script monogram. Machine wash. Made in the USA of imported materials. Personalized/monogrammed orders cannot be canceled or returned. The monogram preview feature displays fabric color (not pattern), thread color, monogram style, and selected initials.